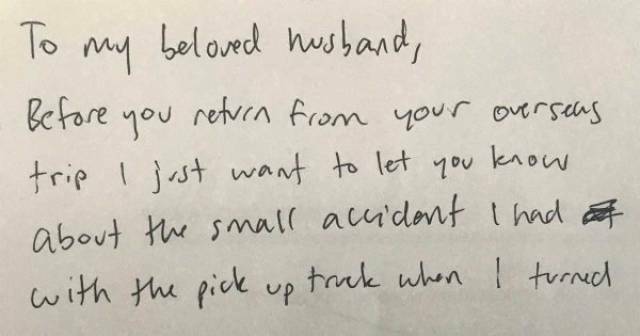 When this woman found out her man was cheating, she enacted her revenge with sweet sarcasm and twisted metal. Her husband was away on a business trip when she made the shocking discovery. Needless to say, he did not return to a warm welcome. Before you return from your overseas trip I just want to let you know about the small accident I had with the pick up truck when I turned into the driveway. Fortunately not too bad and I really didn’t get hurt, so please don’t worry too much about me. I was coming home from Walmart, and when I turned into the driveway I accidentally pushed down on the accelerator instead of the brake. The garage door is slightly bent but the pick up, fortunately, came to a halt when it bumped into your car. 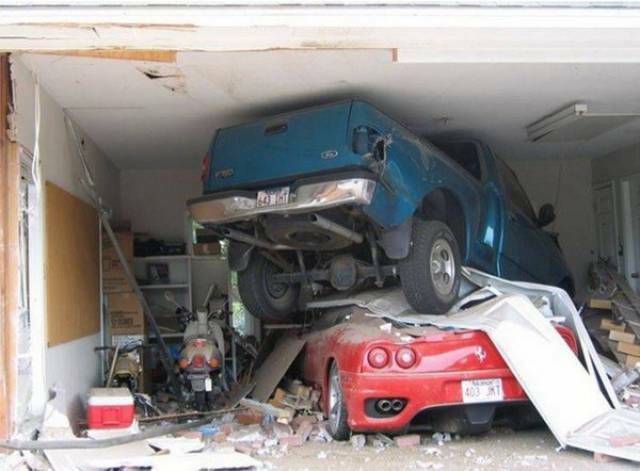 She also left him this mess in the garage. ..